Senators await testimony in the removal hearing of student senator, Patrick Cherubin, Mar 7. CORRECTION: The judicial council will be holding the hearing, not the senate. It was incorrectly stated that the senate will be holding the hearing. 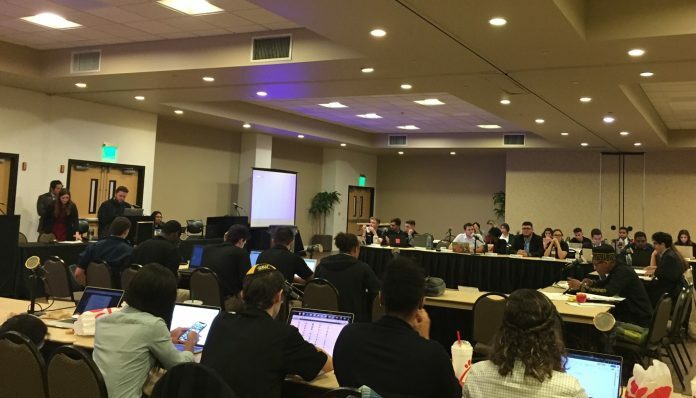 The Student Government Association’s judicial council will hold an appeal hearing in the senate impeachment case, at 6 p.m. on Thursday in the Student Union’s Cape Florida Ballroom, according to a press release. Student Sen. Patrick Cherubin filed an appeal after he was removed March 8, on a misfeasance charge following a nearly seven hour long removal hearing. The SGA chief justice, Julian Mayorga, decided to set a hearing to listen to Cherubin’s appeal arguing possible violations of his self incrimination right and violations of evidence review, according to the order document. The judicial council will hear arguments from Cherubin and Attorney General Robert Hill, who represents the student body senate, Mayorga said in an email. The case started when Rachel Friant, senate committee chair, filed for impeachment on accusations of harassment, misfeasance and malfeasance, which she said were a result of his “excessive” contacts with Registered Student Organizations and comments he made which she deemed to be malicious. The accusations are stemming from Cherubin’s investigations of what he said were “irregularities” in the funding of two RSO’s. The dispute was over the manner in which Cherubin was dealing with RSO’s. The removal went ahead with only the misfeasance charge, because according to statutes neither harassment nor malfeasance are impeachable unless a sanction was issued from the Office of Student Conduct, which did not occur in this case. Friant said during the removal hearing, that she filed a complaint with the Office of Student Conduct in regards to the two excluded charges, after the attorney general made that recommendation.